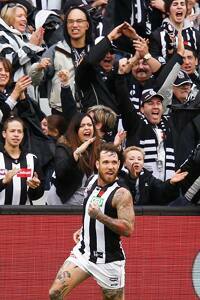 As far as fan favourites go, it’s hard to find a more universally liked player than Dane Swan. While this position has long been entrenched, Swan has further confirmed a place among the hearts of the Collingwood faithful with victory in the 2015 Magpie Army Player of the Year award. The 31-year old midfielder polled 375 votes to beat 2014 winner Scott Pendlebury in the popular fan-voted award. Fellow midfielders Taylor Adams and Steele Sidebottom placed third and fourth respectively, while excitement-machine Jamie Elliott rounded out the top five. Since its inception in 2013, the Magpie Army Player of the Year award has given fans the chance to give their 3, 2 and 1 votes for who they believe was Collingwood’s highest achieving player from the most recent game. After walking home empty handed on Copeland Trophy night last year, being judged as Collingwood’s most influential player by the fans shows suitable recognition for a season in which Swan returned to his brilliant best. The 2011 Brownlow Medallist averaged 29 disposals in his 21 home and away games, as well as averaging a goal a game for the first time since 2012. While he impressed fans at a constant rate throughout the early stages of the season, it wasn’t until the back-end of the year that Swan hit his purple patch. From round 18 through to round 21 Swan led the Magpie Army Award’s weekly voting, with 43.2 per cent of his season’s tally coming within this month. After collecting 36 disposals in Collingwood’s shock loss to Melbourne, Swan remarkably took his game to another level the following week against Carlton. His 41 touches against the Blues marked his highest total since round 15, 2013 and capped off a stellar run of form. Despite limping off the ground with a knee injury in Collingwood’s victory over Geelong in round 22, Swan’s return to power in 2015 signalled that after 13 seasons in the black and white, the three-time Copeland Trophy winner has plenty to offer in 2016 and beyond.